Public transport is not working in Athens on Thursday as the two biggest Greek labor unions go on strike over the closure of the national broadcaster this week. The government chose to axe ERT to save money amid the ongoing recession in the economy. 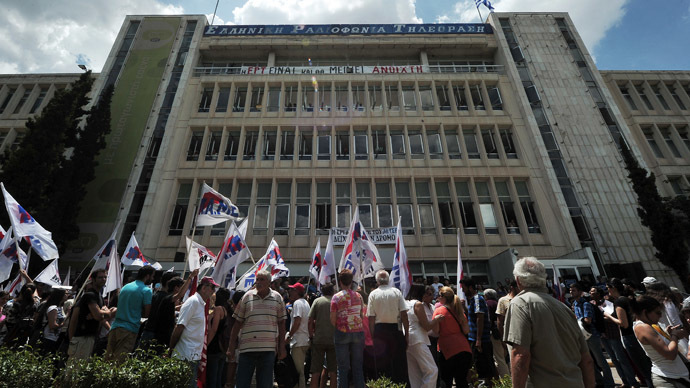 GSEE and ADEDY, which represent about 2.5 million workers, are planning to keep the county at standstill for 24 hours in a protest against the government decision to shut down the Hellenic Broadcasting Corporation (ERT) earlier on Tuesday. "We call on every worker and every citizen to fight to overthrow the government's catastrophic plans," ADEDY said. The state-run Athens subway entrances were closed by shatters in the morning. City buses did not run. Other public sector workers are also expected to join the strike. Several protest marches are scheduled for the day, with a big rally expected in front of the ERT’s headquarters, where employees remain in defiance of the government decision. 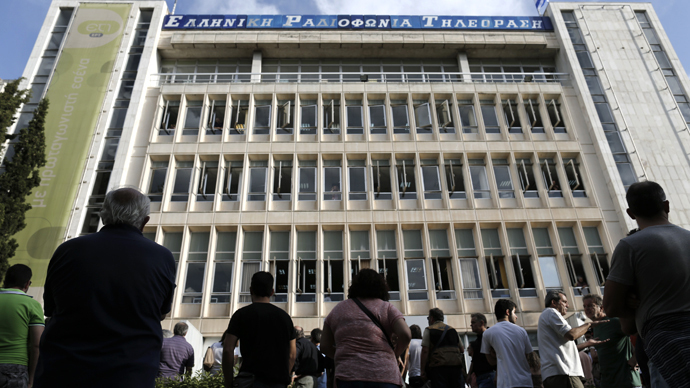 Separately a journalists’ union in Athens has called on an indefinite strike of media outlets. Their move prevented some newspapers from appearing and forced some commercial broadcasters to suspend news from their programming. The protest, however, doesn’t seem to have won support from the private sector. Shops, cafes and other businesses in Athens are open and serving customers as usual. Official Athens insist that the closure of the 75-year-old broadcaster is a temporarily measure needed to reform the company and re-launch it in a more efficient form. They cited overstaffing and waste of public money as the reasons behind their decision. The government regards defenders of ERT as hypocrites defending a moldy publicly-funded employer, which is criticized for becoming a source of patronage jobs for political parties. 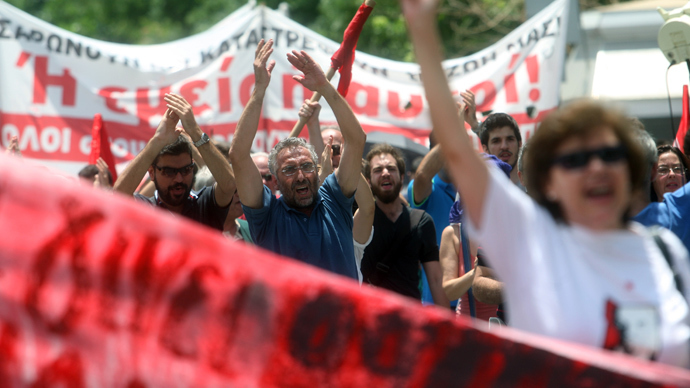 Among the critics of the decision are some members of the Greek coalition government as well as international journalistic and human rights organizations. Supporters of the broadcaster see the sudden shutdown as a "coup-like move... to gag unbiased information." "What we experienced yesterday was unprecedented, not only for Greece but for all of Europe," left wing leader Alexis Tsipras said as he addressed protesting ERT workers. "Public television goes dark only in two circumstances: when a country is occupied by foreign forces or when there is a coup." ERT had more than 2,500 employees before its sudden closure. The channel had lost some of its popularity to commercial television, with its three nationwide channels retaining a combined audience of about 13 percent. Greece is enduring years of economic recession with unemployment climbing up to almost 27 percent. The country relies on bailout money from international creditors to stay afloat. 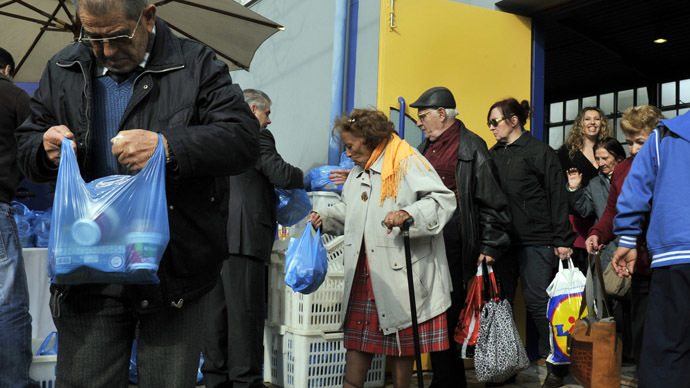 Greek government has to reduce public spending in order to secure further trenches. Public sector workers were among the vocal opponents of the policies, as they saw they wage and job cut to adjust to the thinning budgets.